This small, open plan home provides a welcome retreat from the bustle of Russell in the summer and is situated only 3 kms from town. There is plenty of space to enjoy including a belle tent, deck and outdoor seating areas. It is quiet here in Orongo Bay. You share your space with the local birdlife so if you bring your pet please keep them well supervised. The master bedroom is roomy and has a comfy king bed. There is a small bedroom with a single bed and a single bed in the open plan lounge. You are welcome to camp out in the belle tent which has a double and single air bed and fold away bed. There is plenty of room for parking and lawn space for games and spreading out. Please be mindful that we are on tank water so do not run taps etc for longer than needed. As your host I am happy to meet you, settle you in and leave you to enjoy your stay. All linen, towels and extra blankets are provided. There are many kitchen items, crockery, cutlery, glasses etc for your use. The bathroom is small with wet area shower. It also doubles as a laundry! We have wifi and netflix here but no tv reception. There are also books and dvds for you to use. Hi! I'm Joanne (Jo). I work part time as teacher at a local school and enjoy making improvemnts to my land here in Orongo Bay. My parents, Joe and Ann (true story!) puchased this property back in 1966. The cottage built in 2008 is on 2 acres that I now own. My folks ran a horse trekking business back in the '60's taking visitors up the hill that overlooks the cottage. Accomodation in Russell was rather expensive, even then, so to make a Bay of Islands stay more affordable for all they built the lodge and caravan park you see below at Orongo Bay. I'm happy to carry on that tradition by offering the Tui's Nest to you and your group. It's affordable, has everything you need and plenty of outdoor space and privacy. It's located just minutes by car to Russell and all the walks, beaches and activities. The master bedroom is lovely featuring a super king bed and a view of the untouched beauty of the surrounding hills. Camp out in the belle tent. Enjoy the open plan lounge and kitchen. Play on the vast lawn. Heaps of parking space. Safe and private. The bathroom is small. Room is available in the cabinet for your toiletries. There are a couple of 'spare' items such as insect repellent which you are welcome to use. The laundry is also in the bathroom. There is a 'wet' floor and walk in shower. There are no steps so ideal for those who require a flat surface for safety. The view of the hill from the master bedroom is a nice way to start the day. Although you can see water on both sides of the hill. It's not a big feature of this property. An older style electric heater. Plenty. Including for a boat or camper. This area is open plan so is easy to go between the kitchen and dining. There is a large outdoor table on the deck. There is kiwi watching in the area and many walks. Beautiful peaceful spot to stay. Certainly pet friendly! My partner and I stayed here for 2 nights with our dog Tui. 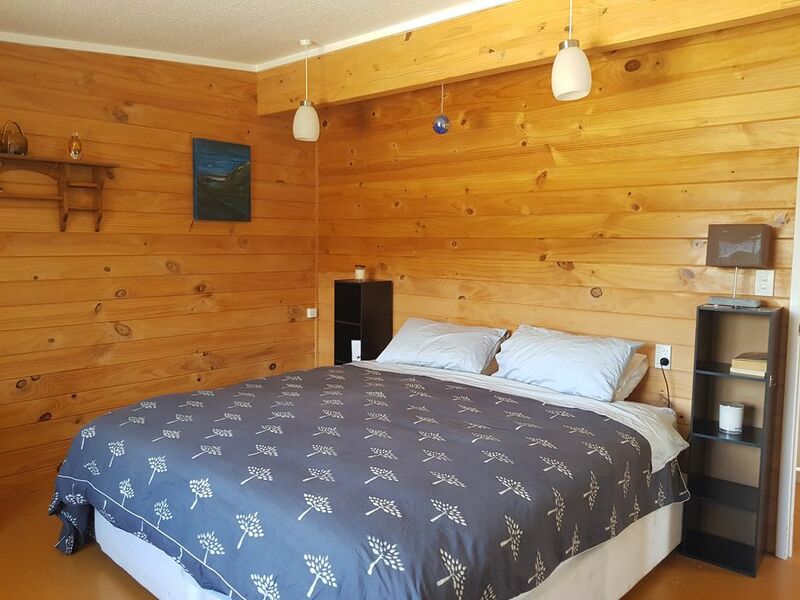 The cottage is a very clean, well equipped and looked after property peacefully surrounded by bush and absolutely pet friendly! The king bed in the master bedroom sleeps very well and it provided us with restful nights. Hearing the kiwi calls at night was an absolute bonus. Highly recommendable for couples and small families with or without dogs! Orongo Bay has an oyster farm, a boardwalk and local bird tours. It's only a 5 minute drive form the township of Russell where other activities are based. The grocery shops sell a good variety of produce.